This was an interesting project! 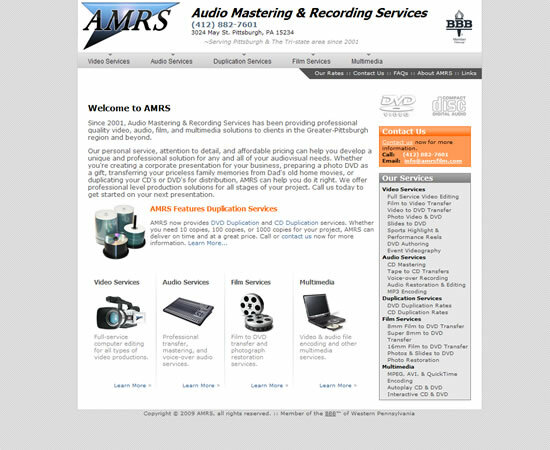 AMRS Film’s website was fully functional but due to problems with their designer and their previous hosting provider it was impossible for them to make any updates to it. To make matters worse, they did not have the original source files to migrate the site to a new hosting provider! We were able to create an identical copy of the site, at the same time making it very easy for AMRS Film to make any updates to the content whenever they need to. We then put the new site on a much faster server, dramatically improving the site’s overall performance. This was achieved with zero down time and no interruption to site availability. © 2009 - 2019 WebSAP.net. All rights reserved.